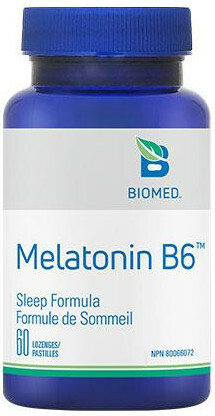 Melatonin + B6 is a high potency formulation to promote natural sleep. Decreased melatonin production and sleep issues can develop with aging and lifestyle factors (artificial light, shift work, late night/altered sleep schedules, and exposure to electrosmog including laptops, television, and computers). Taking melatonin helps regulate sleep-wake cycles, resets circadian rhythms, increases REM and total sleep time, and improve overall sleep quality. When combined with vitamin B6, melatonin biosynthesis, secretion and absorption is enhanced. Melatonin is used to support difficulty falling asleep (delay sleep phase syndrome), waking in the night, jet lag, increasing total sleep time (shift work, jet lag, late night/altered sleep schedule). Research shows that melatonin benefits goes beyond improving overall quality of sleep. Known at one of the body’s most efficient free-radical scavengers, melatonin has powerful antioxidant, anti-inflammatory and immune properties for brain, neurological, heart, and cancer protection. Adult: Take one tablet before or at bedtime, or as directed by a health care practitioner.